This is my most autobiographical poem; but it contains gems I think many others will identify with. You can read more of what I learned about the Bible during independent studies by downloading my free ebook: "What I Told My Son About the Bible: Things the Clergy Doesn't Want You to Know." I hope you enjoy reading "On a Path." 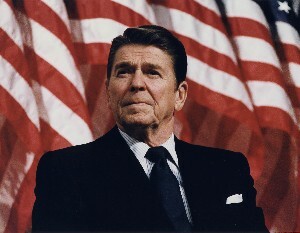 Ronald Regan was the 40th President of the United States. He is greatly missed. After I emerged from the blur, Mom & Dad claimed I’d been born. They must be right because I can see light. Mom spoke of days & nights but every year family & friends gathered and sang me a birthday song. It must be important; another year was shorn! During the early years I was told of Santa Claus, the Easter Bunny & the Tooth Fairy. I even saw Santa on TV as he warned, "Boys & girls should be nice." It convinced me; he must be real. I also learned of Jesus at Sunday school. I thought he was the boss of every day. Nothing could be, if he didn’t approve. "We’ll be okay if we don’t stray." In the late 1950’s grade school was a chore but my friends and I had a laugh. We kicked & batted balls, skated on the rink and drew & colored pictures in art class. I even won some ribbons running & jumping on the track. One day, some preachers came and put up a circus tent in the nearby field. They invited all the people and we heard the word and offered our coins. But one dark night someone lit the abode and flames were seen in the sky. “It was God’s will!” the preacher said, before they moved on to another berth. “How could it have happened?” my young mind thought. "Why didn't Jesus put out the fire?" But soon after, I guess I forgot. In the 1960’s the world wasn’t safe as the Cold War was all the rage. When the Cuban Missile Crisis showed its face, some said God’s wrath was closing in. The nuclear scare caused people to hide in shelters with food & water in locked huge bins. Meanwhile some preachers claimed, "Surely Jesus will come in the nick of time and save us from our sins." Some turned their ears and listened to rock & roll. The Hippies dropped out, inhaled a lot of smoke & put flowers in their long hair. 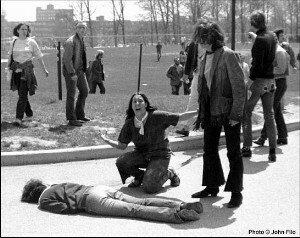 Out went the call, “Protest the war in Vietnam. Build a human chain and stay in pace!” Then some young bodies dropped as the clocks on campuses stopped. In the war's wake, even Johnson’s spin couldn’t rewind his second bid. In the 70’s we were surprised that we still walked around. There were new tunes and a disco dance, but the decade’s ideals soon lost its sheen. As the pace of life became a rush, I went to a southern Bible college and listened to their dream. I wanted to serve but preferred to stay awake. Objectors didn’t fit within the frame, even if they were kind. At the decade’s end, it was time to move & I left in a hush. The 80’s took a turn to the right. The music played on at Regan’s party as they began the 40th dance. The economy soared as old oaks were cut & roads were repaved. New structures stood tall but got soaked with acid rain. They declared a war on the 60’s and even planned a Star War’s shield. Near the decade’s close, bubbles began to burst. The debris of Iran-Contra was in the gale that knocked down the Berlin wall and broke the Soviet Union. The world wasn't the same and everyone wanted praise & passed along the blame. In the 90’s I learned religion was like politics, just another game. I had studied the funny history. The book of Genesis raised the curtain on the play but our planet is very old, just as Darwin and others claimed. Three gospels clearly forecast the heavens would shake when the Kingdom of God finally came. But Jesus failed to show, like it was told & the first century church got a blemish. Then pseudo-John invented a different lord. When the 4th story was told, the protagonist specialized in saving souls & kept the second coming out-of-sync. The history was rewritten. The act included the Revelation myth that added to the muddle. The cover-up salvaged the faith, by keeping people guessing. Everyone could be right and no one was really wrong. Some said. "The prophecies didn't fail. The kingdom is already here; it’s the church, you see." Others kept on saying, "Just look at the signs; it’s coming later in the year!" After the new millennium turned, Y2K fell out of grace but the 2012 fiction soon took its place. I watched & looked around; even if the dice were cast the serendipity is profound. In the fog it looks as though events were to be. Then I realized I live within everything called ATI. * It’s not about tales or schemes. Even though myths and delusions abound; science & logic wears a crown. If you want to know what’s real, open your eyes and see! *ATI means "all that is."